Dear Readers, I was hoping to satisfy your curiosity as to my whale-related whereabouts this week, but the truth is that there has been so much activity that I’ve had not a second to compose something for you. So, I hope you will forgive me and enjoy this piece that I wrote back in June for just such an occasion as this. Next week all will be revealed! Dear Readers, it’s fair to say that summer in the city can seem to be a feast of rather unpleasant smells. There’s the smell of fat from Kentucky Fried Chicken when the wind is in the right direction, the ripe whiff of uncollected organic rubbish, and a slight scent of diesel. At least we aren’t still assailed with the perfume of sewage that used to be wafted skywards by the stink pipe pictured above. 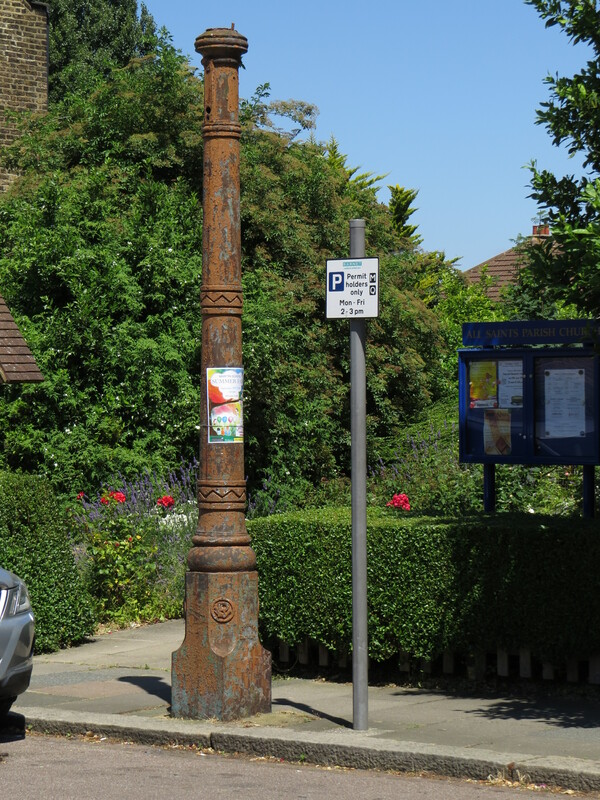 However, a leisurely ramble along the County Roads in East Finchley can present the perfume connoisseur with a veritable feast of pleasant scents, intensified by the humid atmosphere and the hot concrete. For example, who can resist the scent of a full-blown rose? 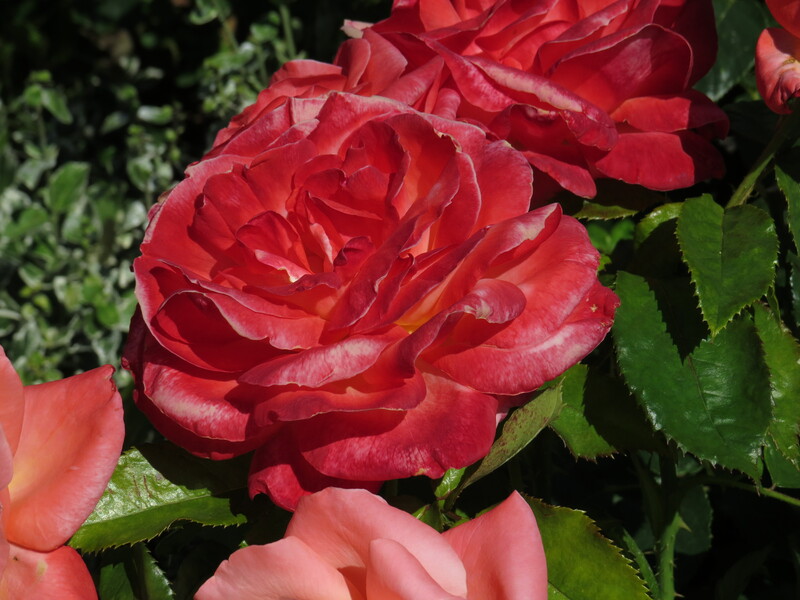 Actually, there is wide variation in the scent of roses, from the floral via citrus to musk and even chocolate. This rose reminded me of classic floral with an overtone of lemon, and I could have stood there with my nose in it for an hour if the pose hadn’t been killing my back. 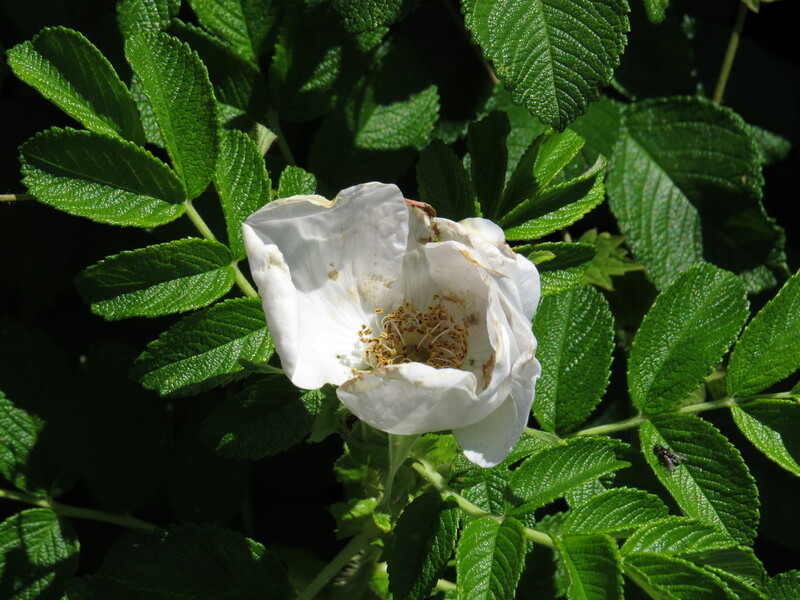 These roses are not so popular with pollinators, though, who prefer the more lightly-scented single flowers of the Rosa rugosa species. And then there is jasmine. There are some splendid example on the County Roads, including the one that’s clambering over my friend A’s fence. 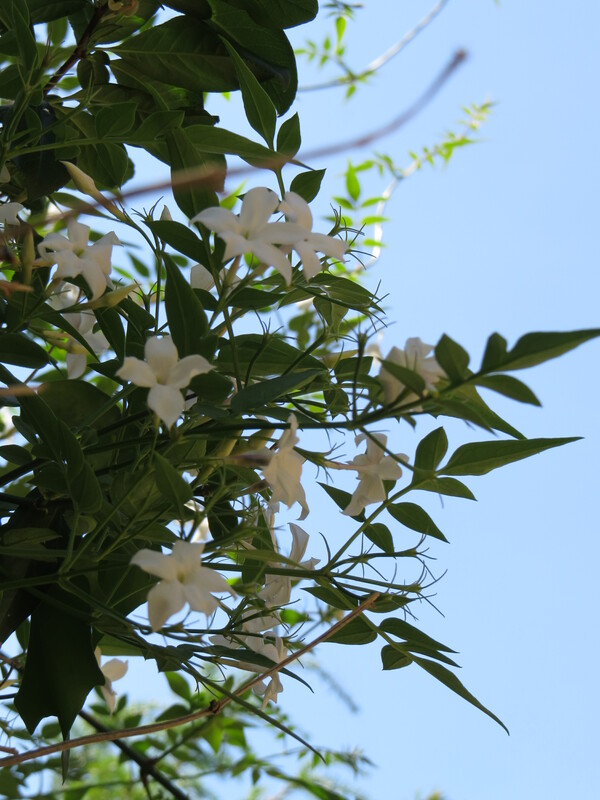 Not everyone likes jasmine, as I’ve mentioned before – it is a waxy, sweet scent, a bit redolent of decay and decadence. I am convinced that Edgar Allen Poe would have been a fan. Today the scent seemed to come in pulses like a heartbeat. 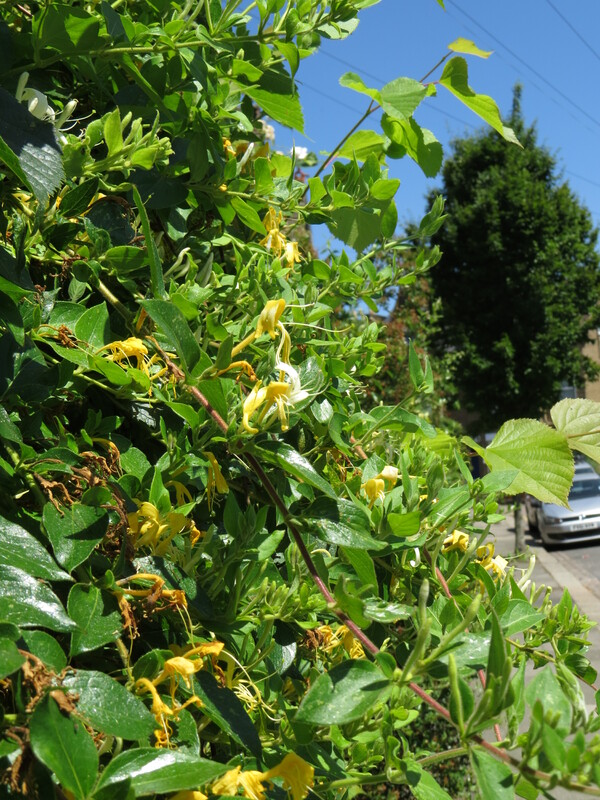 And, surprisingly, some lucky person had a hedge of classic honeysuckle. It was going over a little, but there was still a trace of the honeyed perfume. It always reminds me of walks along hedgerows in the West Country as a child, with moths and bats rising over my head. Some of the showier varieties of honeysuckle have no smell at all, and I marvel at the breeding that could remove the key factor of a plant’s attraction in favour of a change of colour. 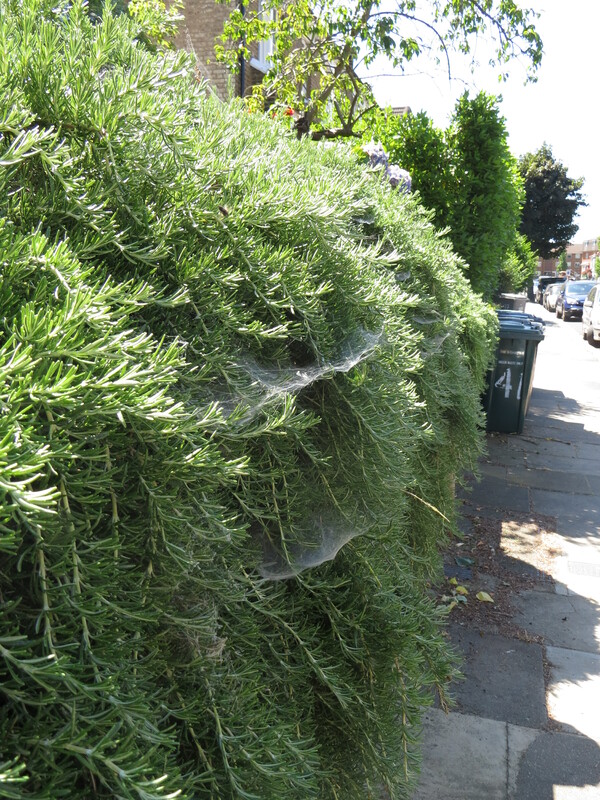 Some plants need a little encouragement to reveal their scent, like these splendid rosemary bushes, interwoven with spider webs. I love the spicy, resinous smell of this group of herbs, although I know many people who think that it’s a bit overwhelming and dominates the dishes that it’s used in. 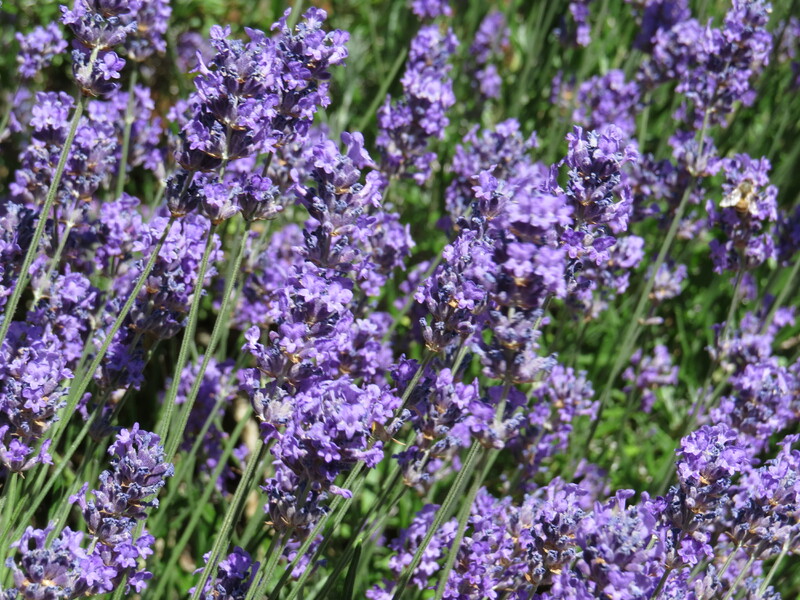 And in the same family, of course, there is lavender, the bee flower par excellence at this time of year. The bushes in my front garden reveal their scent as I brush past them to get in at the front door. This year I must remember to dry some. And as I walk into the house for some much-needed shade, I smell honey so strongly that it’s as if someone has opened a pot of the stuff and warmed up a few spoonfuls in a saucepan. I pick up the buddleia flower and inhale. No wonder the bees and butterflies love it so much. It’s absolutely delicious. 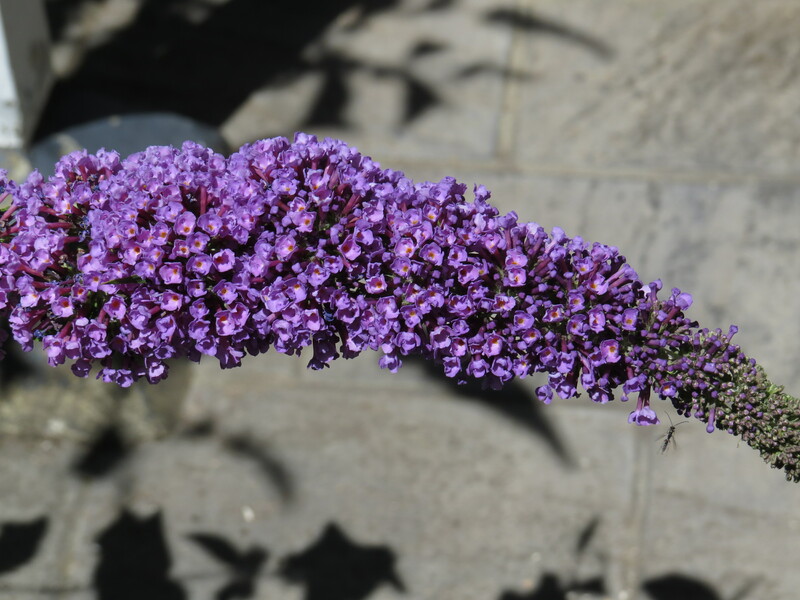 But I suspect that the smell of buddleia will always remind me of my mixed emotions during this troubling year, and will bring me both the wistful pleasure of remembering my parents, and the stomach-knotting sense of dread that seems to accompany every phonecall and visit. A scent can become subliminally linked to a set of emotions, and we often don’t realise the link until we breathe in a lungful of a long-forgotten perfume and it all comes rushing back. Smell bypasses our conscious processes and catapults us into the past, whether we want to go there or not. It is said that the sense of smell is closely wired to the most ancient part of our brain, and it certainly seems to have a way of reaching past our consciousness and accessing our emotions directly. This entry was posted in Uncategorized on September 8, 2018 by Bug Woman. Yes smell is an amazing memory peg…orange blossom transports me back to my 5 year old self in Italy on first holiday abroad, hot London city pavements and alleyways take me back to New Delhi! Thanks Anne! I always smell the different soaps if I’m in a posh shop. I love fig particularly…. Honeysuckles are such an odd group. I have tried a few, but my favorite is still the classic Japanese honeysuckle. The others are not pretty enough to be interesting without fragrance. I would not mind them not being pretty if they had fragrance to offer. Burmese honeysuckle was popular a while back. It has big glossy leaves, but the flowers were not much to look at, and are devoid of fragrance. I don’t get it. I took a pass on that one. Red honeysuckle recently became available here. I am not sold on it, but I really want to get familiar with it. We have a young specimen at work now! Glad to know that odd iron pillar is a stink pipe. It’s always puzzled me. A beautiful evocation of the scents of summer Vivienne, so true that they can be unpleasant as well as pleasant and that they can evoke such memories when we least expect it. I too love the scents of rosemary and lavender, especially because they seem to be hardy enough to flourish under my inadequate attention. Hope the whales are doing the right thing When we were in Iceland last year we only saw one tail. I wonder why my so-called perfumed flowers always fail to delight me? Do they not smell, Toffeeapple, or do you not like the scent? Perfume is such an individual thing…. They have no perfume at all – Phlox, Honeysuckle and Stephanotis, as barren as a dry stone.